Recommended to: Readers who enjoyed the first in the series, and also readers who crave a good action-packed read! Summer's story continues in Forsaken Harbor and this time it sets off at a wild pace. From the very beginning, Kreitzer throws her characters into the fray and there isn't a moment to breathe. Summer, Gage and the rest of the crew all make an appearance in this installment. I think thought that they were more vivid than ever. However the reader is also introduced more in depth to a new character named Julian. Being another Society experiment, Julian adds a very different twist to the book. I won't spoil, but I will say that his story is fascinating and rather sweet as well. I'll admit it, I swooned over him just a bit. Any unanswered questions that you may have had at the end of Phantom Universe are answered in this book, and so much more about Summer's lost history is unraveled. I loved the way that Society's master plan was slowly unveiled in pieces throughout the overall story. Treachery, love, and despair are just a few of the emotions that fill this book. It's exhausting, in a good way of course, how often the feelings of these characters are elated and then dashed to the ground. I felt for them so much. In my opinion, the writing in Forsaken Harbor is also much better than the first book. Everything is crisp and clean. The chapters flow into one another beautifully. It's extremely easy to get lost in Summer's manic quest to stay alive. My one gripe, and it's a very small one, is that some of the chapters were a bit wordy in their descriptions. It didn't take away from the overall story, but it did slightly slow down the pace of the action. Small gripe, as I said. Still an amazing book! To wrap things up, this second book in the Summer Chronicles really impressed me. 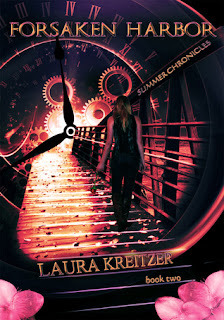 I was hoping for a lot from Laura Kreitzer this time around, and I'm happy to say that I wasn't disappointed. I strongly recommend that you give Forsaken Harbor a place on your reading list.